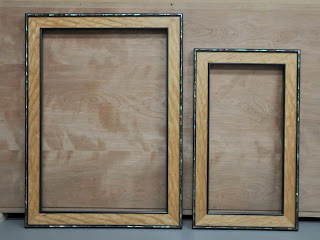 ok, the challenge ... to help scott with his show, (see the previous post), at the last minute, (thursday night) he needed two sort of large picture frames, (+/- 39 x 60 x 2), painted black ... will said he could do them and we were off. 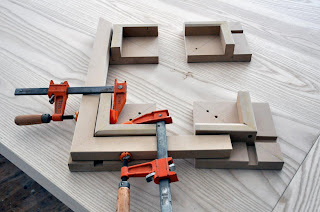 * try as best you can to be accurate with these corners too as they will tell you about where to clamp your first piece of mitered frame stock. see below . * add pieces the exact thickness of the frame stock rabbet around the verticals (these can be removable for future different frame stock, to allow the mitered pieces to sit flat on the jig ..
* if you're good to go, unclamp and glue each corner in turn. when you're done, you should have a perfectly square, glued up, mitered frame. Glad you posted this because I hate making picture frames. I have some beat-up only corner clamps, but your method is better. Do you ever smack your self on the forehead and say "DUH!" I just did. GREAT JIG! Thanks for sharing it with the rest of us. I am off to the workshop now to make one of these... could not have come at a more perfect time.. 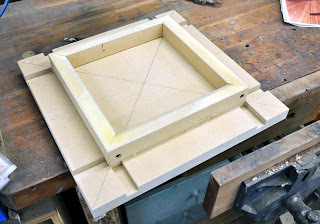 I have a new student who wants to make frames... this will be great.. thanks for posting. Well done m8 makes life a lot easier, thats another jig to make on my to do list. All this time and money spent on schools, classes & seminars to try and improve upon or craft. And all it really took was your arriving at that ahh ha moment to figure it out, Welldone. I have always had a pet peeve about mitres due to the slipping and sliding. I have bought so many differtent gizmos to solve the problem and none work as well as this jig you have figured out. I had made something along these lines while in my Cabinet Making/Fine Woodworking classes at college. But what I hade done was to shoot two pces of MDF to a substrate at 90 deg. and use that one confirmed 90 to clamp to. 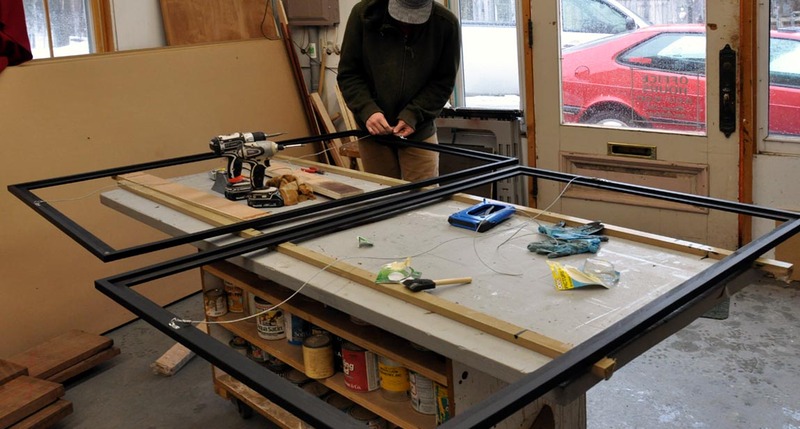 The great thing I like about your idea is that you can move the jig to where it is needed instead of always moving the project to the jig. My wife can't understand why I spend so many hours on the computer reading woodworking blogs and snooping around other woodworkers web sites. The amount of knowledge I have gained over the years from browsing different sites and blogs is incredible. So much more than by reading a book or taking another class. I have gained a huge amount of knowledge from following your site and blog. I thank you very much for being so willing to share your knowledge and craft with the rest of us. I guess I just love working with wood and am always looking for new ways of doing it. Old dogs can learn new tricks as long as we are still willing. Looks great. 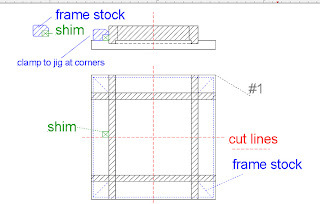 I'm not sure about the following step:"* notch (rabbet) the corners of those strips (for rigidity), get a nice fit and glue them into the dadoes" I'm assuming you cut a 1/4 " rabbet to allow the 1" stock to fir into the 3/4 " trenches. Very nice jig thank you for sharing. Well done! I will be making a couple of my own sets first thing in the morning! 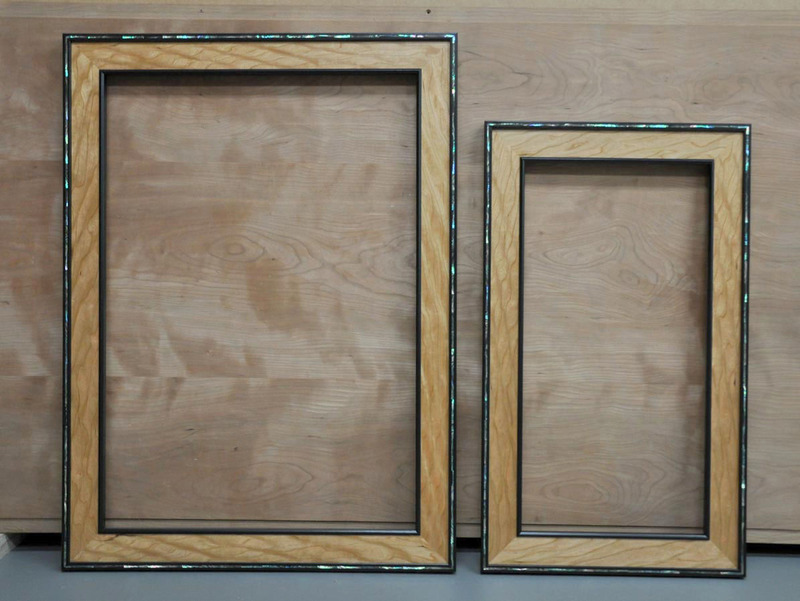 Jig looks great, I think I'll build one. Just one mod though. I think it would be better to put the rabbit on the outside of the jig. 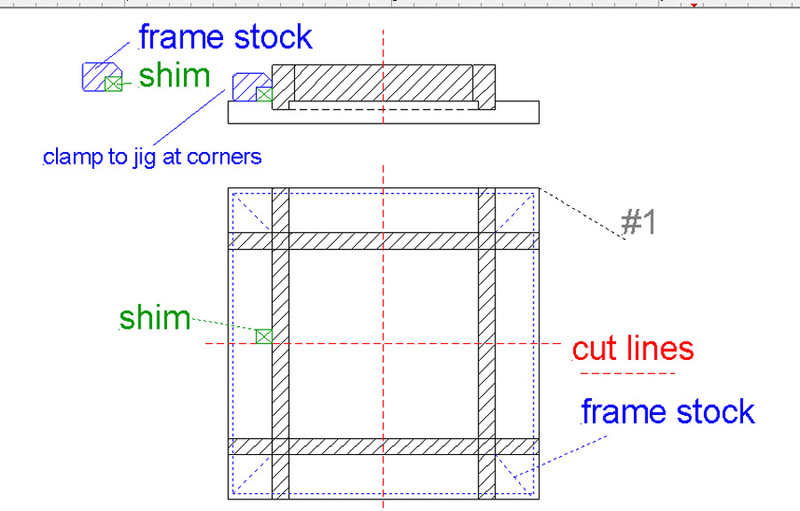 Perhaps that would but that inside corner in compression from the forces during clamping instead of shear.